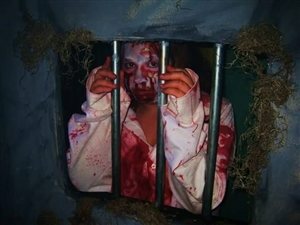 PAHauntedHouses.com recently sat down with Laura Minnich of The Haunting of Elks Lodge #714, to discuss what's new at The Haunting of Elks Lodge #714 for the 2016 Halloween Season! Located in Bridgeport, this attraction is housed inside an old 1900's building that is believed to have some true paranormal occurrences, including an exorcism of the property itself. With tons of frightening fun in store for the 2016 Halloween Season, The Haunting of Elks Lodge #714 is sure to satisfy the appetite for fright you've been hungry for all year long! Find out what's in store at this Montgomery County attraction, and grab some friends to see who is brave enough to complete the haunting journey! What's new at The Haunting of Elks Lodge #714 for 2016? Do you have any new rides, attractions, or special features that Haunt Seekers should know about? EVERYTHING! Because our haunt is smaller than others, we choose to re-build our entire attraction every each. So if you have visited us in previous years, you will get a brand new experience every time. In 2015, we were voted the PAHauntedHouses.com #1 Haunt in Pennsylvania!! We are thrilled to be honored with this award and are hoping that it may bring more visitors out to our haunt. What differentiates The Haunting of Elks Lodge #714 from other local haunts in Pennsylvania? Our haunt is run by the ELKS, which are a non-profit organization. All the actors are volunteers and do it for the love of the scare. We build many of our own props and pride ourselves in bringing a more personal scare with actors, not animatronics. We only allow one group at a time in the building, so YOU are our focus throughout your entire time in the building. How long has The Haunting of Elks Lodge #714 been in business? Can you tell us a bit more about The Haunting of Elks Lodge #714's history? The building you enter was built in the early 1900's and is home to many strange and unusual happenings; including a rumored exorcism of the building itself. In addition to creaky stairs, cold drafts and unexplained noises during the day; at night our haunted house is one of the scariest haunts in Montgomery County. Now in the hands of the non-profit Elks, each October for the last 8 years, we transform this historic place into a unique Halloween experience. Each year we overhaul our entire haunted house so visitors experience a new haunting year after year. What's your favorite experience since opening The Haunting of Elks Lodge #714? We have a strong following from our local community. It is always so amazing to see familiar faces return year after year. Sometimes we have guests that come every weekend! How long is a typical haunt experience at The Haunting of Elks Lodge #714 from start to finish? Our haunted experience generally lasts about 15-20 minutes. We really make great use of our space and try to keep our guests engaged the entire time. On a scale from 1 to 10, how scary would you say The Haunting of Elks Lodge #714 is? Why? I would give it an 8! We provide an up close and personal scare, which I think really resonates fear for most people. Our building is old and creepy all on its own and adding the props and decor really brings it all to life! Does The Haunting of Elks Lodge #714's property have any real haunted history? Do you have a spooky encounter you'd like to share? There are quite a few people, including myself, that have had paranormal experiences on the 3rd floor of our building. All of them have said they have seen a young girl. There are rumors of an exorcism being preformed on the 3rd floor as well. There are also many unexplained noises and phenomenon. We were looking for a fundraiser to benefit our benevolent works. Each year our lodge would decorate the building for Halloween, we decided to take it one step forward and invite others inside our old building. It was so well received, that we have continued the tradition each year. It just keeps getting bigger and better! How has new technology (i.e. animatronics, special props, etc) helped you to enhance The Haunting of Elks Lodge #714? As I stated before, we LOVE to build our own props and animatronics. We want to have special effects that no one has ever seen or tried before. We stay away from store bought scares. Can The Haunting of Elks Lodge #714 accommodate large groups? How many people can experience The Haunting of Elks Lodge #714 together as a group? We limit our groups to 6 people at a time. With the tight, confined spaces in our basement it does force us to limit the number of people we allow in at one time. I believe that helps make our haunt unique, we provide a VERY personal scare. Does The Haunting of Elks Lodge #714 offer any special deals, discounts, or coupons? 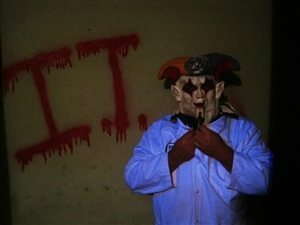 We offer a $1 coupon through www.pahauntedhouses.com and our personal website www.hauntingofelkslodge714.com. Anything else you'd like to let us know about The Haunting of Elks Lodge #714? We are a unique Haunted House. We don't try to compete with the large attractions, we try to give our guests a different experience with a one of kinds scare. We keep our prices very low to allow everyone to be able to take part in our adventure.